How Do I Measure Correctly? Please Note: All brands fit and size differently, we ask that you always measure and refer to the size chart guide. When Measuring Always measure wearing underwear ONLY, as any extra clothing may change your measurements and affect sizing. Always use a flexible tape measure. Please read the Product Description as some fabrics have a stretch component in them. Bust Measure around the fullest part of your bust over your bra. Swimwear will require you measuring without a bra on. Beneath your bust, measure directly beneath your bust. Natural Waist Measure around the thinnest part of your waist, which will be close to your belly button, but above your hips. Low Waist Where Jeans and Pants will sit, which is on the top of your Hipbone. Hips Measure the fullest part of the hips with your legs together the tape measure should go lightly around your buttocks as well. Thigh Measure the outline of your upper leg right the way around. Inner Leg Is from the very start of your leg, right to the bottom of your ankle. Length Is from the shoulder seam of a garment, down to the bottom seam In the case of a strapless or halter dress, this will be from top of trim to the bottom of the seam. Armpit to Armpit This will tell you if a garment is wide enough, coats are measured this way, lay the garment flat and measure from one armpit to another. Skirt Length For skirts, measure the front center of the garment from the top of the waist to the bottom of the hem. Waist to Waist Lying flat on a table, coats are measured from one side of the waist to the other. Please follow the manufactures instruction . A girl after our own heart! 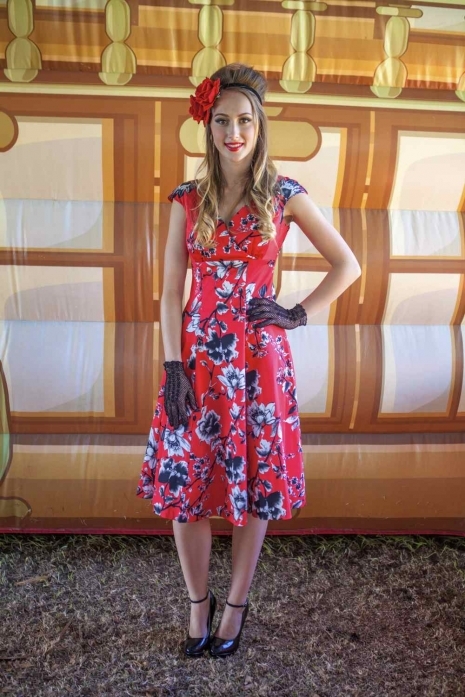 The Empire dress - where have you been all my life … Nostalgic and exquisite in every way. This dress will make you feel like royalty. This dress features a cross-over bust, empire line, and a flared gored skirt. It is high quality 100% cotton sateen fabric and has a back zipper . The shaped skirt minimises and flatters your waist and hips to give you a beautiful silhouette. A great mainstay in any pin-up girl's wardrobe. A vintage dream dress.